Foliar nematodes (Aphelenchoides fragariae) are microscopic roundworms (0.5-1.0 mm long), which mostly live, feed and reproduce inside the tender tissue of hosta leaves. They cannot be seen by the naked eye, but are visible when observed with a dissecting microscope. The foliar nematode is in the genus Aphelenchoides. Nematodes are pathogens (disease-causing) much like fungi or bacteria. Two other species, A. besseyi and A. zitzemabasi are also of significant importance on commercial ornamental crops. Typical symptoms begin as yellow discoloration in late June, indicating that the nematodes were feeding. Later the affected areas develop into chocolate brown streaks, islands or wedges bordered by veins. 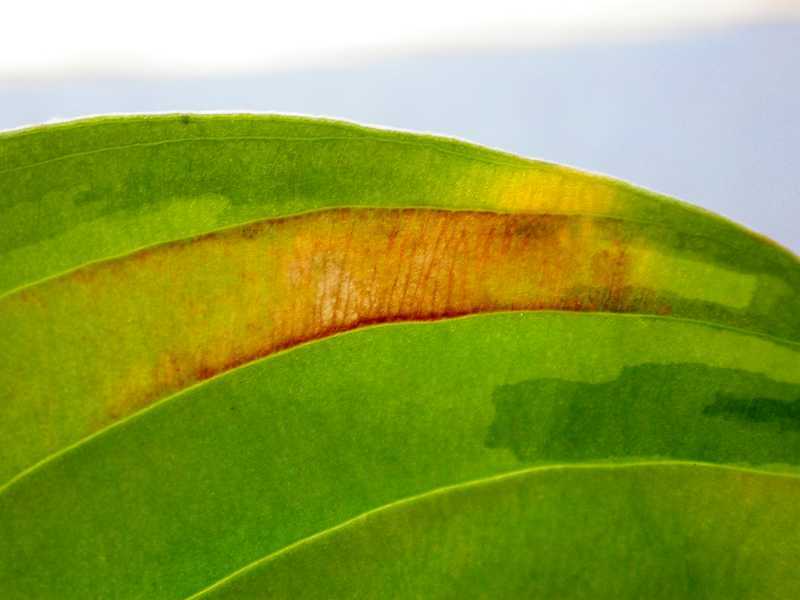 The important clue to watch for is that the yellow and brown areas occur only BETWEEN veins and that the brown color can be seen on both the front and backside of the leaf. 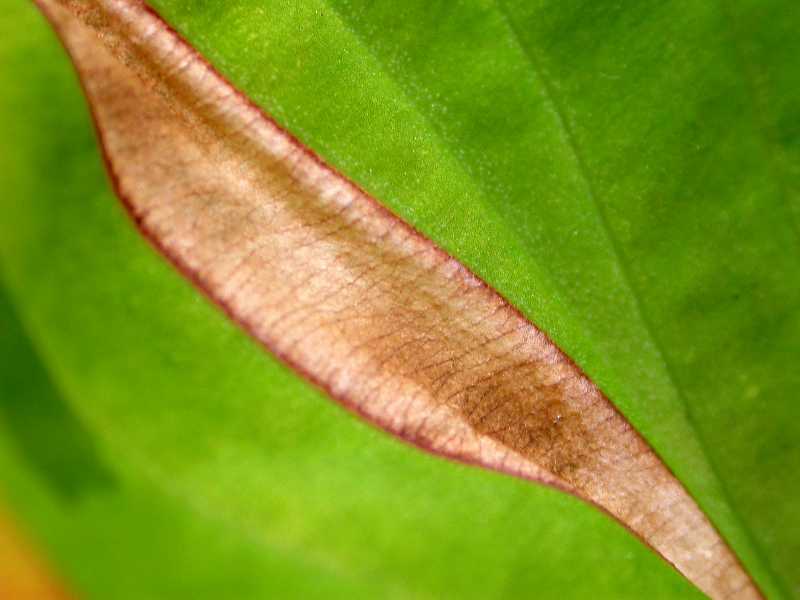 Eventually the entire leaf turns brown and dries up; typically the youngest leaves at the shoot tips are free of infestations, but the older leaves show progressively severe damage. To diagnose foliar nematodes, break or open the leaves showing symptoms (yellow or brown between the veins). Put some water on a piece of clear glass or a clear glass dinner plate or petri dish. Let the cut edges of the leaves stay in contact with the water for 30 minutes to over night. Then hold the glass plate over a lamp so the light shines through the water and leaves, and examine carefully, preferably with a magnifying glass or dissecting scope. The nematodes, if they are there, will settle out or swim out of the leaf tissue and be seen as actively moving, glistening tiny white threads. The presence of a stylet in the head is a conclusive clue to determine if the observed nematode is a plant pathogen. From chlorotic or necrotic tissue can emerge different nematode species, including saprophytic ones, but only those with stylet are pathogens. The stylet can be observed under a microscope. Foliar nematodes spread by contact between plants in the presence of water. They can enter either through leaf pores or stomates or by puncturing the leaf surface with their stylet, a needle like organ used for piercing and feeding. As it moves within the leaf, it kills cells causing them to darken. The only barrier to nematode movement within the leaf is the leaf's larger veins. The female lays 20-40 eggs. The young hatch and go through 4 larval stages before becoming adults. The entire life cycle can be completed in 2-4 weeks. 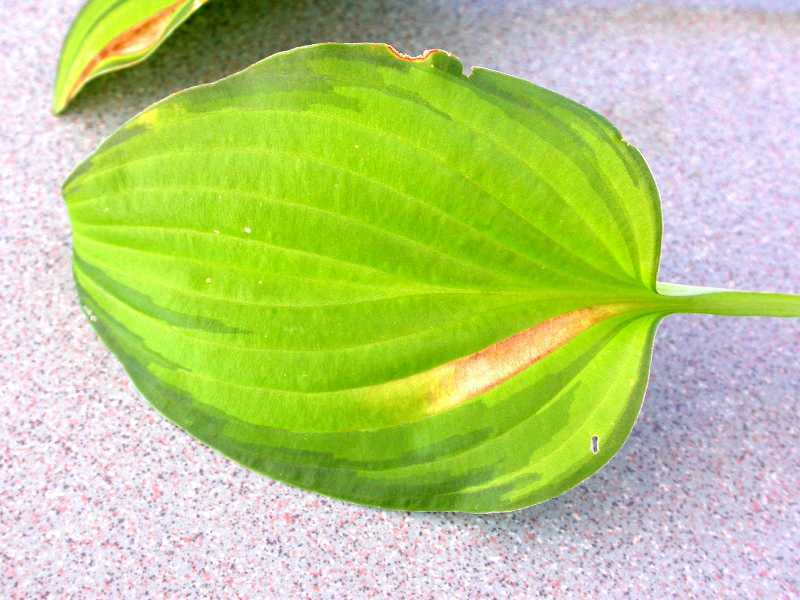 Any infected leaf will contain multiple generations of nematodes. These nematodes can survive on soil fungi and overwinter in the soil as well as in plant debris. They are not killed by winter's cold unless the plant is killed. Adults are the most infective and resistant stage and caan remain in dormancy under unfavorable conditions. An impressive characteristic of the foliar nematode is the ability of one stage in its lifecycle (fourth stage juvenile) to survive almost complete dehydration. As the leaf tissue dries up, the nematodes at that juvenile stage also dehydrate .In this dried state it can survive for as long as two years. When moisture becomes available again, the nematode rehydrates and moves into a new host and begins to feed. The nematode population is renewed and so is plant infestation. Foliar nematodes have broad host ranges-including Anemone, Bergenia, Begonia, Helloborus, Verbena, Heuchera, Veronica, Astilbe, Geranium to name a few-- and are capable of infecting hundreds of species of plants, though they will never kill the plant. The host range for A. fragariae could be greater than 250 species. 1. Sanitation. 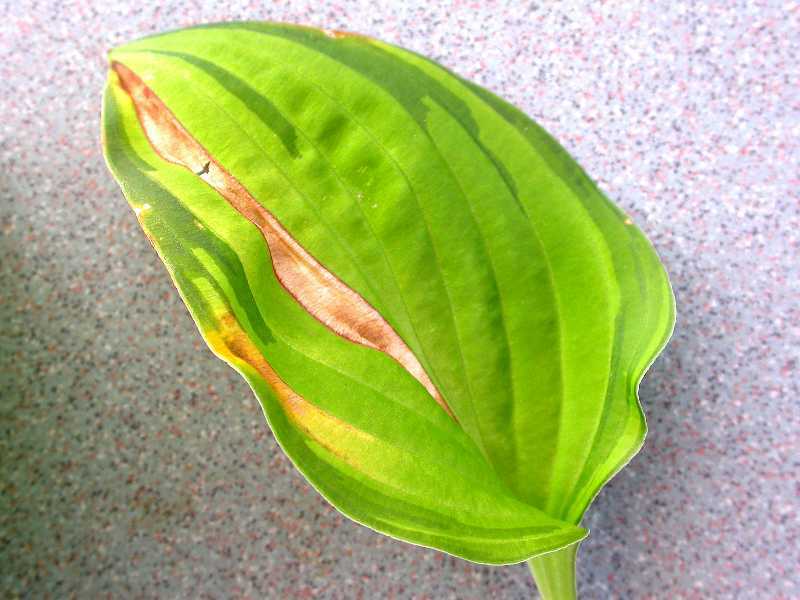 Inspect new plants for symptoms, and do not buy plants with questionable necrotic tissue. Discard any contaminated stock. Cut and burn the infected leaf. Do not compost the leaves as the nematodes may live in the compost. Perform a complete clean-out in the fall, removing all dried leaves and stems. 2. Check the companion plants like ferns for the tell-tale brown markings. Remember the host range of the hosts foliar nematode may be greater than 250 plant species. 3. Use good hygiene in the garden. For instance, when pruning or deadheading, dividing or cutting, clean all tools using 10% bleach solution before moving to the next plant. 4. Choose an irrigation system that is a drip-line rather than over-head sprinklers. Do not wet foliage while watering, as the nematodes move in films of water outside of leaves and stems. 5. Foliar nematodes are easily killed by heat. Some gardeners have tried to heat-treat plants but this may not be very practical for gardeners. Soak infected plants in hot water (120-140 degrees F.) for up to 10 minutes (you may wish to divide plant up and soak 4,7 and 10 minute intervals). Beware, however, you can kill the crowns if the water is too hot or if they are dipped too long. Immediately following the hot water treatment, the plants are plunged in a bucket of cold water (as cold as possible from the faucet). Do not leave plants in the cold bath more than about 5 minutes. Use just enough time for the tissue to cool. Drain and pot the plants immediately. Plants do not store at all well after this dipping regime, so it is best to treat plants about the time they would be breaking dormancy. Unfortunately, because the nematodes can survive saprophytically (can take nutrients from dead organic matter) in the soil, the long-term efficacy of this approach is questionable. (based on information from the University of Minnesota). 6. Few chemical controls. There are nematicides labeled for nursery use, these products are EXTREMELY toxic, especially to fish and wildlife, and are not available to the homeowner. Misapplication of these pesticides has been linked to death of hundreds of songbirds, fish and wildlife. It truly has no place in the home landscape. Strategies 1, 2, 3, 4 and 5 are strictly organic approaches.